New discoveries over the past two decades have shown that the body periodically gives us important physiological clues about how to stay energetic, healthy, and productive. 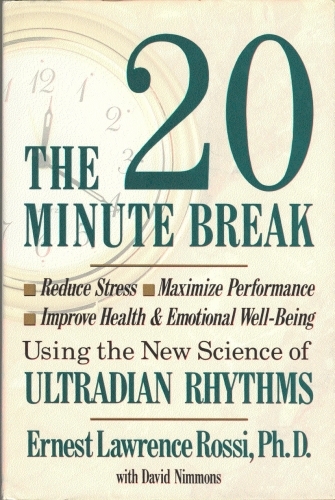 In The 20-Minute Break, Rossi and his coauthor David Nimmons, translate this research, particularly studies that have led to the new science of ultradian rhythms (those bodily rhythms occurring more than once a day), into practical strategies for recognizing the body’s natural signals for optimizing creativity, performance and healing in everyday life. According to the theory presented here, our mind-body systems need a natural period of healing and rejuvenation for about 20 minutes every 90 to 120 minutes. Often we neglect the signs telling us that rest is needed, recharging instead with caffeine, sugar, nicotine — short-term fixes that set the stage for fatigue, poor performance and long-term health and emotional problems. The 20-Minute Break presents strategies for overcoming such destructive habits, for breaking patterns of stress and tension, and for capitalizing on the body’s natural periods of creativity, alertness and healing.